Travel Therapy features vacation and destination options based on what you're going thru in life. Written by an Emmy award-winning journalist that has traveled to more than 30 countries Travel Therapy offers a unique way to look at travel. Going thru a breakup or divorce? Stressed out at work? Looking to spice up your romance? Let Travel Therapy be your guide to a happier, healthier life. This travel blog is really cool because it has some different trips and vacation ideas that I haven\'t seen before. It\'s also updated daily so I feel like I\'m staying on top of things. This what your Travel Therapy Blog Ad will look like to visitors! Of course you will want to use keywords and ad targeting to get the most out of your ad campaign! So purchase an ad space today before there all gone! Top 10 Trips for Dad-Travel Deals! Forget about the traditional tie and socks this year get dad a gift he’ll really love a trip tailor made just for him! Check out these top ten affordable gift ideas for dad from Emmy award-winning travel writer Karen Schaler who is the author of the new book Travel Therapy: Where Do You Need to Go? featuring top trips based on what youre going through in life! Where would your dad love to go? Also check out the new TRAVEL THERAPY website at http://www.traveltherapytrips.com. featuring the top vacation ideas and travel deals from around the world! Here’s a great video from the TRAVEL THERAPY travel segment I did with ABC News Now looking at the top trips to take right now if you’re stressed out, going through a breakup, burned out at work, looking for romance or just want a way to reinvent yourself. Great video and pictures! What trip do you like best? The Shark diving? Spa? Volunteer Trip? Great news! TRAVEL THERAPY is now on FACEBOOK so you can sign up and join the TRAVEL THERAPY page and share your travel photos and stories! Just look for theTRAVEL THERAPY Book Cover and that’s the page you want to join! Exciting news! My TRAVEL THERAPY book is now available to pre-order on amazon.com AND right now you can get a fantastic discount. Love it! Here’s the deal. To make it super easy I’ve added the link to buy the TRAVEL THERAPY book to my website at www.traveltherapytrips.com. Just look on the left-hand corner of the site under “Buy Now” and you can click directly on to amazon.com and buy the TRAVEL THERAPY book at a great discount! The best part is you can order the new TRAVEL THERAPY: Where Do You Need To Go book for more than 30% off AND there’s also a free shipping offer right now. So that makes the book less than $14, wow! That’s the cheapest therapy I’ve ever found! TRAVEL THERAPY is also now on sites like Borders but not for this great discount so wanted to give everyone a heads up to take advantage of this great early deal. I’m even ordering some TRAVEL THERAPY books this way because it’s such a great deal. I also like how Amazon.com is set up that if the price goes down even lower before the book is shipped next spring you can get the lowest price. So if you want to take advantage of this great early offer all you need to do is order TRAVEL THERAPY now and then just sit back and relax and wait for the book to come your way early next year! Thanks for all the support! Stay tuned to this site for more updates. This week I’m finalizing plans for a VERY exciting book launch party in New York City! 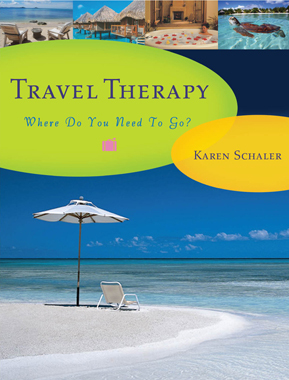 Here is a sneak peek of the cover of the new TRAVEL THERAPY book by Emmy award-winning travel writer Karen Schaler. This world-class travel book is coming out next April! After all the hard work it’s amazing to see the TRAVEL THERAPY book finally come to life. The inside is even more impressive. More than 350 pages are filled with beautiful, inspiring color photography and insider information about more than 100 different destinations around the world. The TRAVEL THERAPY book, published by Seal Press, features life changing vacation and destination options based on what you’re going through in life. Suffering through a breakup or divorce? Stressed out at work? Looking to spice up your romance? Let TRAVEL THERAPY be your guide to a happier, healthier life. For more on the TRAVEL THERAPY book go to the new TRAVEL THERAPY website at www.traveltherapytrips.com. 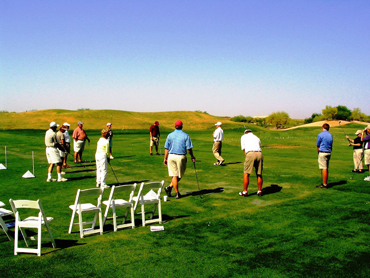 Check out the latest TRAVEL THERAPY story on ABCNEWS.COM today featuring the top golf schools and giving exlcusive tips from the pros just in case you can’t make the schools! Also see other TRAVEL THERAPY stories posted on ABCNEWS.COM and for the lastest travel news head to the new TRAVEL THERAPY site at www.traveltherapytrips.com. If you are the owner of Travel Therapy, or someone who enjoys this blog why not upgrade it to a Featured Listing or Permanent Listing?